One of the nine daughters of Zeus, Euterpe—the muse of music and giver of delight, has arrived on campus. Since its conception in February of 2014, Dora Natella has been working in various ways on sculpting a bronzed goddess. The project for Euterpe’s Gift came as a commission to compliment the renovation of the Louise E. Addicott and Yatish J. Joshi Performance Hall, and after three and a half years, Natella’s work will have its official unveiling at an invitation-only event during the first week of September. In late June, 2017 Euterpe’s Gift was installed outside of the Performance Hall’s lobby. The sculpture weighs in at over 400 pounds and was delivered in a custom-made crate on a flatbed truck, and was then raised from the bed with a mechanized lift and lowered carefully onto its dais. The goddess stands now with her arms upstretched, holding a golden lyre to the heavens to represent the gift of music, and with her green dress flowing behind her. The piece carries an amazing amount of movement and life, and is a wonderful compliment to the renovated hall as well as to the flower garden in which it sits. “It’s about activating the space within the garden and moving us from within just as music does,” Natella said in an interview for Aspire magazine in 2014. 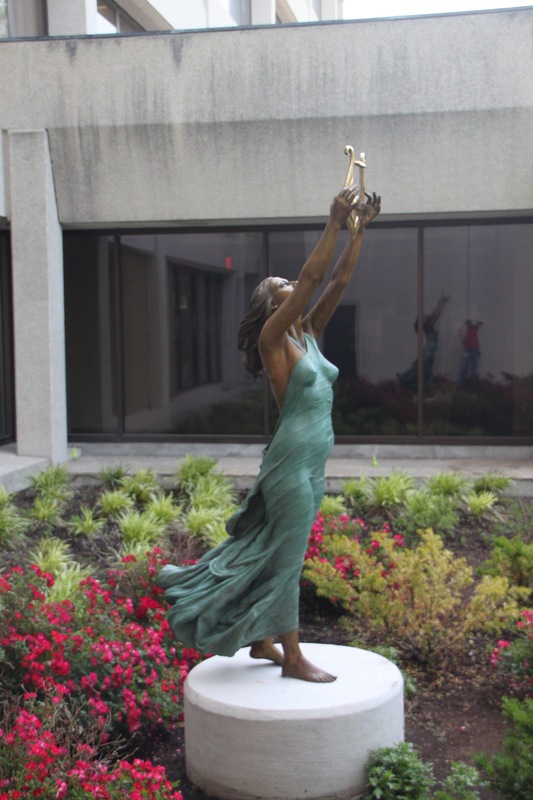 The official unveiling of Euterpe’s Gift will be held in the garden outside the Louise E. Addicott and Yatish J. Joshi Performance Hall, where the sculpture is now resting.